The above certificate records the death of G J A Musgrove aged 55 on 27th April 1900. 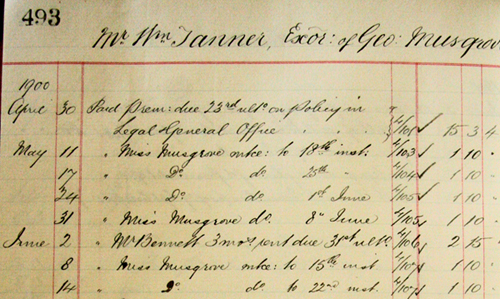 George Musgrove's funeral cost is detailed in his Solicitors account book shown left (click image for full size copy). The account book extract covers the period from April 30th to October 18th 1900. It shows the funeral costs for George Junior on June 10th of £12 - 17s - 0d, two months after his death. When his father died, the funeral charges of £14 - 14s - 0d were not invoiced until October 16th which was six months later. The account book also shows the quarterly rental on Hill Villas which was paid to Mr Bennett, and the weekly household allowance of £1 - 10s - 0d which was paid to miss Musgrove.